Shop jigsaw puzzles for kids and adults alike! Jigsaw picture puzzles are ideal for family nights, rainy days, holiday gatherings or any time you need a "one-size-fits-all" gift! You'll find a variety of sizes and shapes featuring animals, wildlife, landscapes, and more. There's something for everyone--from easy kid-friendly puzzles to to more challenging puzzles for adults. 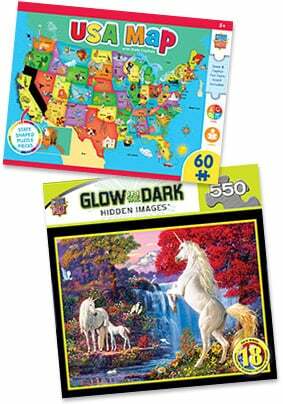 You'll even find educational jigsaw puzzles that make learning fun!